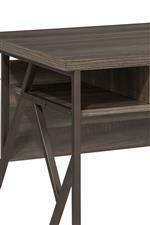 Intriguing modern lines mix with dark edges for a contemporary cocktail table that people will naturally gravitate to. Utilize the extra space its bottom shelf offers and keep extra reading materials close by or decorate it with your favorite curios. This table's handsome laminate surfaces are durable, smooth, and easy to clean. 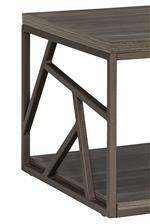 The Studio Living Contemporary Cocktail Table with Geometric Metal Frame by Intercon at Gallery Furniture in the Oregon, Portland, Clackamas, Washington, Beaverton, Northwest, Vancouver area. Product availability may vary. Contact us for the most current availability on this product. The Studio Living collection is a great option if you are looking for Contemporary furniture in the Oregon, Portland, Clackamas, Washington, Beaverton, Northwest, Vancouver area. Browse other items in the Studio Living collection from Gallery Furniture in the Oregon, Portland, Clackamas, Washington, Beaverton, Northwest, Vancouver area.